Sony expands line of NXCAM camcorders. 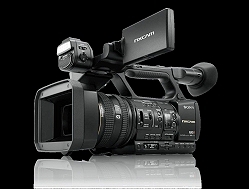 New York, August 2016: Sony is expanding its NXCAM line of professional HD camcorders with the new HXR-NX5R professional compact camcorder, delivering a range of enhancements over its predecessor models. The new camcorder offers upgraded network functions and a choice of advanced XAVC-S 50Mbps or established AVCHD/DV recording formats to help users meet diverse workflows and client requirements. Users can take advantage of the camcorder’s advanced network functions, such as built-in Wi-Fi and FTP wireless connections. Compatibility with Sony’s Multi-Interface (MI) Shoe avoids cabling with easy integration between the HXR-NX5R and Sony’s UWP-D series wireless microphones without need for cables. The HXR-NX5R also includes the industry’s first adjustable brightness LED video light to minimize the need for external lighting equipment. The camcorder’s advanced digital signal processor (DSP) delivers advanced noise reduction and sharp detail reproduction.